PALMDALE – A man struck by a vehicle and pinned against a home in Palmdale Thursday later died at a hospital, and authorities are searching for a suspect seen fleeing the scene. It happened around 4:10 p.m. Thursday, Jan. 24, on the 38500 block of 35th Street East. Deputies responded to an assault with a deadly weapon call and found the victim who had been struck and pinned against a residence by a champagne-colored SUV, according to a news release from the Sheriff’s Information Bureau. The suspect fled the location northbound on 35th Street and out of view, the news release states. No suspect description was immediately available. The victim was taken to a hospital where he was pronounced dead. His name has not yet been released pending next of kin notification. 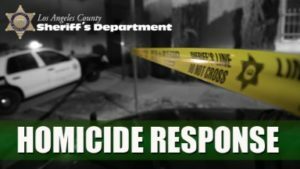 Anyone with information about the incident is encouraged to call the sheriff’s Homicide Bureau at 323-890-5500 or Crime Stoppers at 800-222- 8477. Editor’s note: An earlier version of this story was revised to correct some inaccuracies. The suspect did not run away, but actually fled the scene in the SUV. The suspect and victim has been identified. Read an update to this story here. 7 comments for "Man struck by vehicle, killed in Palmdale, suspect sought [updated]"
They both look like trouble. Takes two to tangle, simple as that. Your not so tough when your dead. All of these tough guys run around the AV thinking they are something special, your not, your just one bad decision from the grave. Either enjoy life and understand what patience and forgiveness is, or pay the ultimate price. I believe you, Trisha. It happens too often.